Military real property inventory, force structure, missions, and governing criteria are constantly changing. Management, decision support systems, and other resources must be continuously monitored and evaluated to respond to or mitigate the effects of change appropriately. SYNCADD manages such change to ensure an installation has an accurate depiction of their ability to meet mission readiness. We have provided requirements analysis and space planning Subject Matter Experts (SMEs) for units, installations, and commands; force modernization efforts; military construction projects; and proposed stationing actions at over 100 locations worldwide since 2002. A Facility Requirements Analysis is the foundational activity for the Real Property Master Plan and assists installations in correctly aligning the right facilities, at the right time, for the right unit or organization. 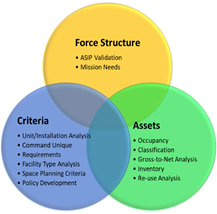 A Facilities Requirements Analysis and subsequent update to the Tabulations of Existing & Required Facilities (TAB) generated by RPLANS provides a common operating picture allowing the installation and higher headquarters to pro-actively plan facilities for upcoming initiatives, stationing activities, and to reconcile existing assets to existing needs using established criteria. The analysis requires validation of the Real Property Inventory (RPI), Force Structure data, excess and deficit data, resulting in recommended edits to RPLANS requirements data and applicable databases (GFEBS and ASIP). The revised data then presents a more accurate picture of the actual state of the installation / unit assets. SYNCADD is on the forefront of developing facility planning and design criteria to support mission needs. We are a key advisor for the United States Army Corps of Engineers (USACE) Centers of Standardization in creation and maintenance of Standard Designs criteria for many mission essential facility types such as Echelons Above Brigade (EAB) Command & Control Facility (C2F) and Company Operations Facility (COF). We are the primary editor of Space Planning Criteria used in RPLANS. SYNCADD is also a contributing author of space planning criteria published by OACSIM, IMCOM, USACE, and HQDA. SYNCADD has extensive knowledge and experience in the development and application of the Army’s RPLANS, its core structure, function, output, and management. We support OACSIM, Installations, and other Army Commands with guidance on every aspect of the program and its functions. We use the system’s allowance and requirements data to facilitate space planning as well as assist OACSIM with system enhancements; data analysis; development of business rules, policy, and guidance documentation; and training. SYNCADD is recognized as the Army’s leader in Real Property Master Planning services and is sought out by customers looking for unparalleled support and integrity. We are focused on pioneering the integration of real property and facility planning data to ensure consistency, promote cost savings, and enable the missions of today and tomorrow.